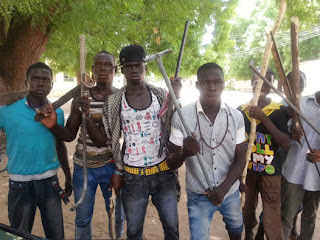 The youth vigilante group in Borno, popularly called ‘Civilian JTF,’ has arrested 19 Boko Haram suspects in five villages in Konduga Local Government area of the state. A member of the group, who gave his name as Ibrahim Yakub, disclosed this on Tuesday in Maiduguri in an interview with the News Agency of Nigeria (NAN). He said the suspects were arrested on Monday after a three-day intensive ‘search and hunt’ for the fleeing Boko Haram members in Konduga town and neighboring villages. Another member the group, Abubakar Adam, said the 19 terror suspects were pursued to Konduga and communities bordering the Sambisa Games Reserve Forest. “The fleeing Boko Haram sect members have been hiding in the forest. “But with the destruction of their training camps and hideouts by the Special Operation Forces of the Nigerian Army in June, they fled to towns and villages bordering the forest,” he said. The Commissioner of Police in Borno, Alhaji Lawal Tanko, who confirmed the arrest of the suspects by the vigilance group, said some rifles and ammunitions were recovered from them. What is the plan of federal govt for these civilian JTF? Can you remember the youth cooper during election , what the federal gave their family ,is it enough””””or worth their untimely death ?their family suppose to be collecting salary from federal republic of Nigeria because these people are valuable more than our stupid senators and honorable that do stealing our oil money. Terrorists r trained 2 cos harvoc. N they hv 2 main aims namely; 2 KILL or DESTROY. At such, tracking dem down, is nt a jolly ride in a roller coaster. 4 dis civilian JTF who hv little or no formal combatant training 2 bravely hunt dis ppl abt is v v risky. So, d Federal Gov rily NEED 2 encourage dis boys dat r making lyf safer 4 d common man out thr rada dan wasting Billions of Naira on mere frivolities. Niger should stop deceiving themselves.How can u ask boko haram 2 watch over boko haram,d troops sent re mostly moslem & majority in moslem re boko harams.so any plan made by Nigerian soldiers must involved boko haram’s member.pls my fellow Nigerian,i ve never predicted any unity unless the whole country become moslem or christain which is not possible,i am thinking that dividing the nation could help to stop this bloodshed. @de joo, why u guy always think that every news posted on this site is not a reality?